Apapa Family, a region within the Redeemed Christian Church of God (RCCG), holds the Excel program annually and this year I was opportune to attend. Excel is a free program which brings people together to worship and praise God. 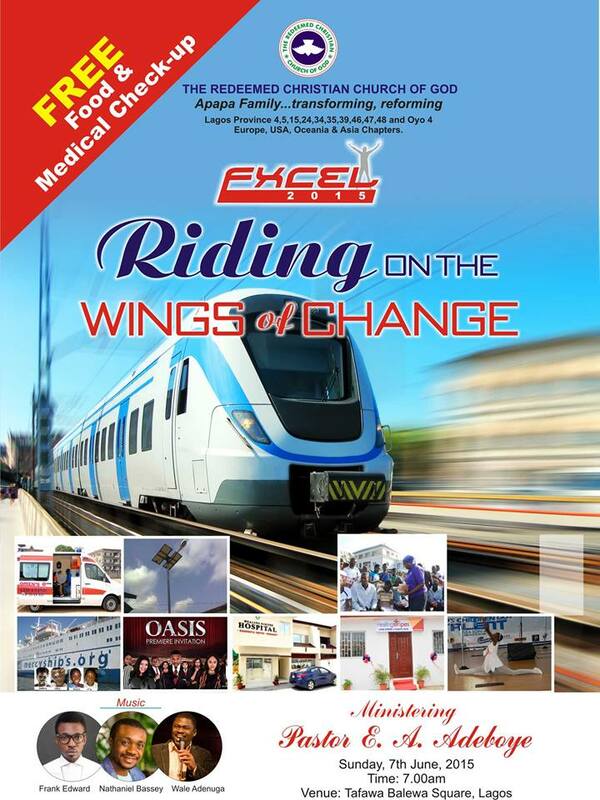 This year’s program was themed “Riding On The Wings of Change” and was centered around harnessing the thrust of change. The Excel 2015 program was highly publicized. Adverts for the program were all over the radio, tv and even on BRT buses so I wasn’t surprised by the large turnout. The program organizers also provided free transportation to the venue which was Tafewa Balewa Square, Lagos. There was also going to be free medical check-up. The Performances and Speeches: I enjoyed the performances by Nathaniel Bassey, Wale Adenuga and Frank Edwards. Their music ministered to me and I was really touched. I particularly liked the speech by the regional pastor, Pastor Idowu Iluyomade. The Venue: I was glad they used TBS because the turnout was AMAZING. I mean over 5000 people! The only sad thing was the rain which disrupted some segments of the event but it eventually stopped raining. The Sermon: The sermon was delivered by the General Overseer, and it was really educative. Daddy G.O is a great teacher and I never miss the opportunity to hear him speak. The Medical Check-up: Although I didn’t participate, I was glad they offered free medical check-up because people who couldn’t afford a regular check-up had the opportunity to get checked for free! The Rush for Food: My goodness! The hustle to get food was totally ridiculous. People were fighting one another for food and I couldn’t deal. The meal package was a plate of fried rice and sachet water (popularly known as Pure Water). The Level of Security: Although there were quite a number of policemen around, I really expected heightened security. I mean, over the top security because the vice president and governor were around. But that didn’t seem to be the case. In conclusion, I had a good time and Excel was an awesome time to connect with God. I’m looking forward to Excel 2016!